Papago Brewing Co. is throwing an adult coloring party with special, limited-release craft beers from one of Germany’s oldest breweries, Weihenstephaner Brewing Co., and locally-owned SunUp Brewing Co. Festivities start at 6 p.m. on Saturday, June 11, complete with food specials, giveaways, extended happy hour, free coloring sheets, and beer-themed coasters to color. Custom-designed coaster packs will be available for purchase, which include four beer-themed coasters to color that participants can take home, 12 Crayola colored pencils, and lamination that for $10.50. Free coloring sheets and crayons will be available on the tables, which will be covered in paper for a fully-engaging coloring experience. Participants are encouraged to take a reprieve from the heat in the air conditioning, get creative, relax with one of our thirty draft beers, and bring their own art supplies for the more serious colorists. To get the creative juices flowing Papago Brewing will be tapping a limited-release of Weihenstephaner’s 1516 Kellerbier, which was brewed in celebration of the 500th anniversary of the Bavarian purity brewing law known as Reinheitsgebot. This special beer was brewed with a rare heirloom hop called, Hallertauer Record, with only one hectare harvested last year. As well as tapping, SunUp Brewing Company’s, cask-conditioned Lager with apples added from their German-born brewmaster, Uwe Boer. The festivities kick off at 6p.m., with the beer tappings, and all draft beer $1 off until 8 p.m. Locally-made Bavarian pretzel $5, and large, 18-inch Flammekeuk Belgian pizzas, $12, all night. The Flammekeuk pairs perfectly with the Kellerbier 1516, and is a Papago specialty made with a sour cream base, topped with beer-caramelized onions, crispy bacon, and Swiss cheese. Weihenstephaner will be on premise with free giveaways. This is a 21 and over event. Adult coloring and craft beer are some of the hottest trends sweeping the nation. An estimated 12 million adult coloring books were sold in 2015, according to Nielsen Bookscan, and the Brewers Association estimates that last year craft beer sales had a $960 million impact in Arizona. This free event is the perfect chance for residents to cool off, try one of over 500 craft beers Papago offers, and participate in two of the most popular trends in the United States. In 2001, Papago Brewing opened as one of the first craft beer bars in Arizona. It started out as a homebrew store that also sold great craft and imported beer that patrons could enjoy while picking up homebrewing supplies and also produced a number of delicious beers that were developed from the owners own homebrewing recipes, two of which won medals at the Great American Beer Festival. By 2003, Papago Brewing had outgrown the homebrewing business and concentrated on serving great beer along with great food at its Scottsdale location. Along the way the Papago Orange Blossom Special Ale became a local favorite and went into statewide distribution. 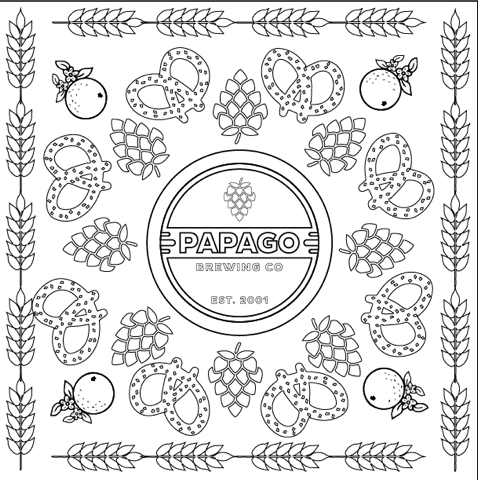 Papago Brewing is located in Scottsdale, Ariz., at its original location with an expanded property that includes dart boards, a shuffle board table, and a group seating area. It currently distributes the Orange Blossom Special Ale, Coconut Joe Coffee Stout, Hopago IPA, and Oude Zuipers Belgian Strong Ale. CategoriesFood Events, Local Food Scene, Press Releases, Press ReleasesTagsAdult Coloring Party, Beer, Coloring, Craft Beer, food events, Local Food Scene, Papago Brewing Co., Press Release, Scottsdale, SunUp Brewing Co., Weihenstephaner Brewing Co. This sounds like fun. But I can’t go. I need this weekend to rest. Thanks for sharing, though. Cheers!